The rideout season is now over. Paul will resume his duties as runs captain for 2015. With temperatures reaching 27° C during the day, it was a pleasant evening when 5 bikes left the Cobblers ground, Thunderbird 1600 (Paul), Thunderbird LT (Ralph), Explorer 1200 (Graham), Sprint 955i (François) and the GPZ (cannot remember if 750 or 900) from new member Tony. With Paul leading the way and Graham in the role of sweeper, the trip along the A43 from Sixfields was pretty uneventful until Brackley. 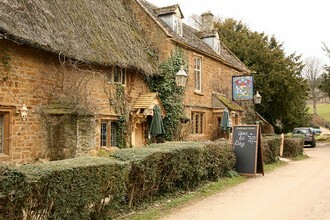 Then, time for some fun on the B4031, going through lovely villages such as Croughton, Aynho, and Deddington on the way, to finish at Great Tew, and the Falkland Arms pub, our destination. Not sure who planned this trip, but the choice of venue was spot on. The Falkland Arms is a beautiful and picturesque pub, where you can also stay the night if you so wish, and the food is said to be very good (guess I'll have to bring the Mrs one Sunday lunch). The village itself is a picture postcard, with period houses giving great character to the place. It is the exact type described by foreigners when they visualise old and quaint English countryside. It will be worth coming back during the day to visit the place. We took a table outside to enjoy the cool evening setting in, surrounded by a horde of Yanks who had descended en masse on the restaurant, had a drink or two, a chat, and it was time to go. We took a different route on the way back, going via Banbury this time, and another fun little road until rejoining the A43 again. All in all, a great evening. Bright and early, branch members arrived at 7:00 am to erect the gazebo and prepare the 8 bikes display. Bit of a damp start, but not really wet, so the gazebo was up 30 mn later. To get their breakfast, the boys went to another café, 5 miles along the A5, so the bikes could get a little run. The afternoon was sunny and warm, which was a bonus, and we even signed a new member. Attendance was quite high this year, compared with the 2013 edition. 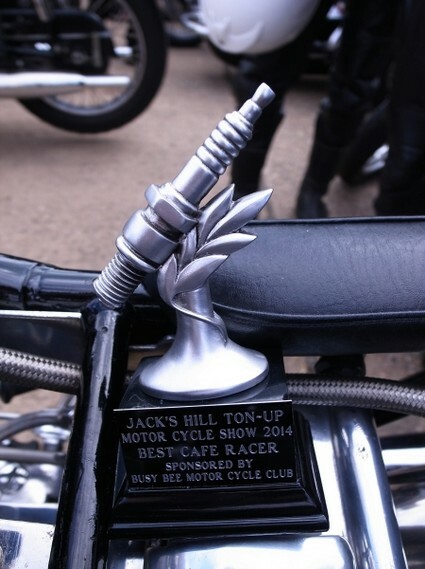 Besides Ralph's Triton, winning 'Best Cafe Racer', there were some cracking bikes on display. Kudos to Jacks Hill Cafe for putting on a good show, where all present enjoyed themselves. Cue Ton-up Day 2015! In fact, when the title says 'owners', it should say 'owner'. Indeed, only one member of the Norton Club turned up at the pub that evening, and better yet, he was riding a Sunbeam 500cc. However, don't think members of the NOC don't go to their club evenings, it's just that whoever planned this run selected the wrong Monday, since Club Night at the Wharf Inn would have been the following Monday! Nevermind... At least, 9 Northants TOMCC riders made it to Welford: Dougall, Kev, Chris, Phil & Phil, Neville, two new members, Chris and Steve, and a rare sight this side of the Northants borders, Sarge on a bike! 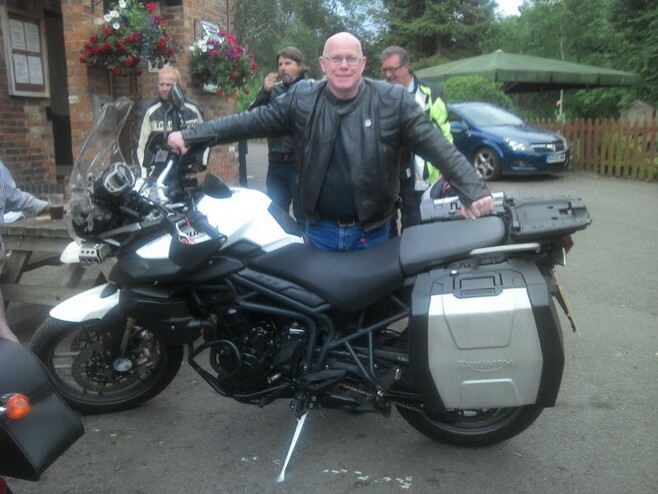 In this case, a new Tiger Explorer 800. Thanks to Phil B. for the report, and Phil S. for the photo. Just three of us, Phil B. on his T100, Phil S. on a Tiger Cub and François on a Sprint ST955i. 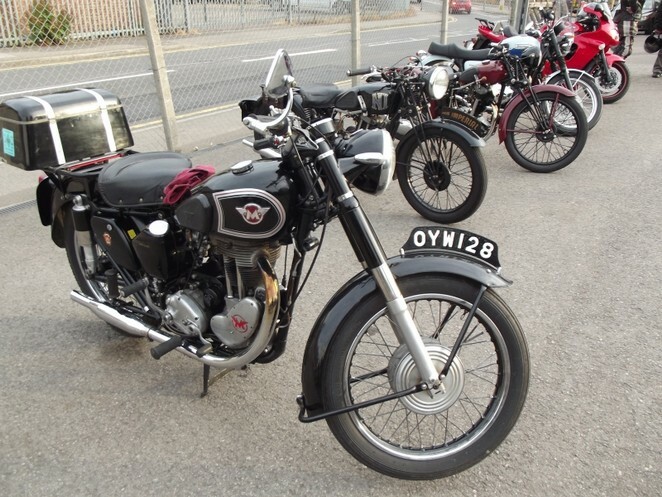 Arriving at the Transport Museum, we met guys from Kettering Classics, the AJS and Matchless specialists, based at the Telford Way Industrial Estate in Kettering. Later on, riders from the Heart of England ASJ & Matchless Club joined the party, and we ended up having a pint or two at the real ale pub, run by the Rushden Historical Transport Society. Kuddos to the latter from running such a friendly pub, with a good selection on offer at a pretty decent price. The evening passed quickly, chatting with old friends and making new ones, which is exactly what it's all about, isn't it?! The run had been rescheduled due to bad weather. This time, conditions were perfect for an evening run to the Talbot Inn, HQ of the Peterborough Branch of the TOMCC. Six met at Pure Triumph, T100SE, Street Triple x 2 , Daytona 955i, Sprint ST955i and T140V. Led by Phil Short, who managed to not exceed the speed limit, a feat in itself (! ), we arrived in Stilton just after 8:00 pm. 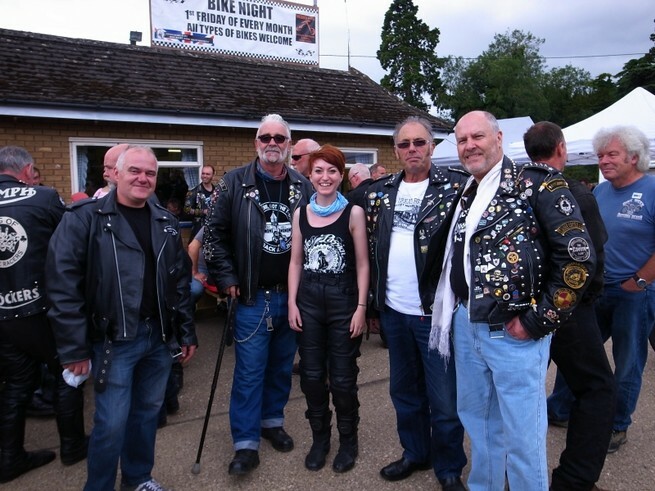 The Peterborough boys had just returned from their ride and many bikes were already parked, as can be seen in the pictures gallery. We were impressed by the turn out - at some point, around 40 motorcycles must have been parked on the street. Our Cambridgeshire colleagues are a vibrant club, run by friendly chaps. Thanks to Dave, the chairman, but also Robin, Richard, Alan, Laura and Mike (and those I forget to mention), who made us feel welcome. 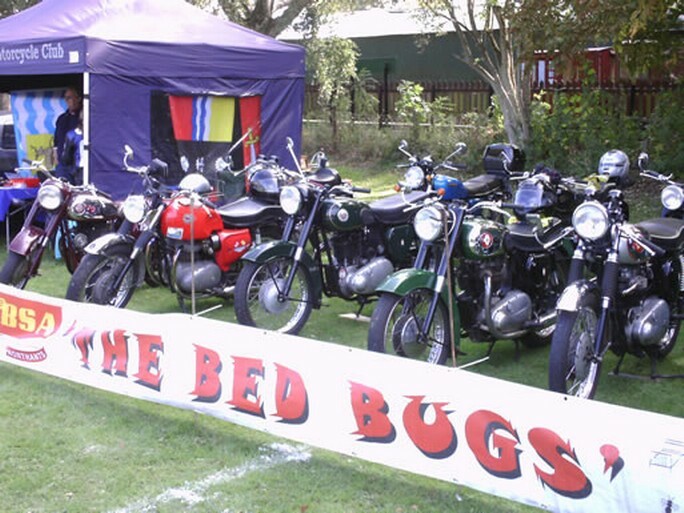 We look forward to seeing you again when we have our branch display at the Stilton Motorcycle Show in August. Looking forward to this one and, for once, the weather was playing ball as well. 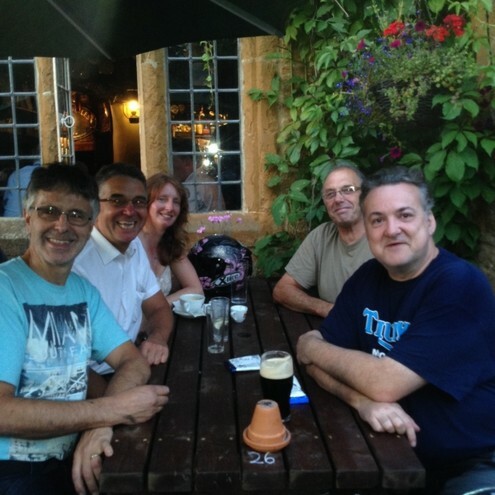 We met at the Queen Eleanor pub, off the A45 in Northampton at 6.45pm for most, but 7.00pm for me as I was running late! Phil Barton was volunteered to lead and off we went down the B562, then through Salcey forest, down to Cosgrove. Nice route and good pace. We arrived at the pub a bit early, a few minutes before the "old girls" started to arrive. There was a good selection of BSAs on display, a few other models from brand such as Velocette, plus a handful of Triumphs from various owners other than us at TOMCC — good taste these lads! Bikes present were T100 x 3, Sprint ST x 2, Street Triple, Thunderbird 1600, and even a Harley. Pete also joined us at the pub, but on a Honda. See you later, I'm on holidays so Francois has been promoted temporarily. Cancelled due to bad weather and special meeting of the branch to discuss club nights location. 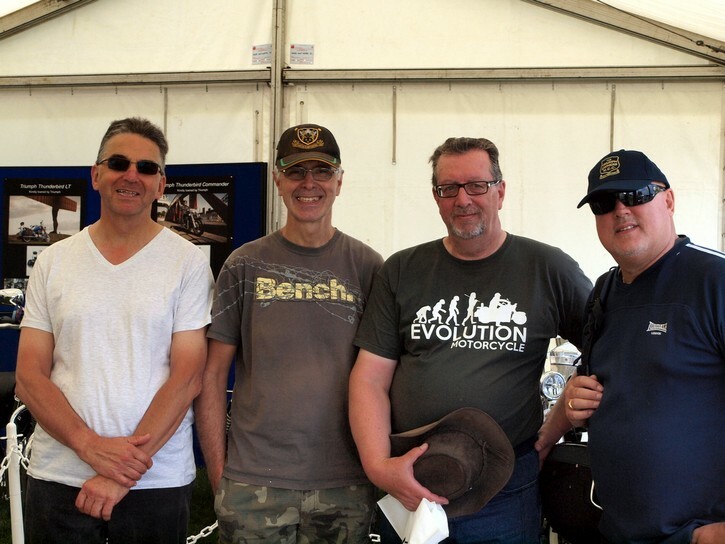 Meeting at 10.00 am on a small layby off the A45 were Chris (Bonnie T100), François (Sprint ST955i), Graham (Explorer 1200), Mark (Rocket III) and Paul (K100 BMW). We set off at a leisurely pace and got to the Peterborough Arena, as it is now called (used to be East of England Showground), a bit before 11.00, neither early nor late as the car park (or should I say bike park) was about half full. After queuing for a while, we got in and were greeted straight away by the vintage machines display from TOMCC. After spending time in the 'Best of Show' section (some cracking bikes & trikes there! ), we went to the TOMCC gazebo, where we missed "El Presidente" (Phil Barton) by about 30mn according to the guys manning the stand. Wandering about, there were the obligatory pitstops for burgers and Double Dog ale, the latter a pleasant surprise at only £2 a pint. The group parted company around 15.00, for everyone to do their own things before riding back home. A bit disappointed by the lack of official Triumph presence (the factory had lent the new Commander and LT Thunderbird for the TOMCC display), but a nice time with kindred spirits and, for some of us, putting a face on names, especially from the Peterbrough TOMCC branch. We all reported present and correct at Pure Triumph Wellingborough and headed out at 7.15 pm. The clement weather made the ride to the Cowper's Oak at Weston enjoyable, plus we didn't lose anyone - result! The first round of drinks was on me, as a way to say thanks for the members support in getting ride outs off the ground. Then, Mr Short had the cracking idea of going back to the George Inn in Wilby for a burger, so a mad dash it was, but we arrived there ' just in time '. Great ride , great weather and great company! Neil, Phil S, Phil B, Chris, Paul M, Lynn and Joy. Photo by Paul A. 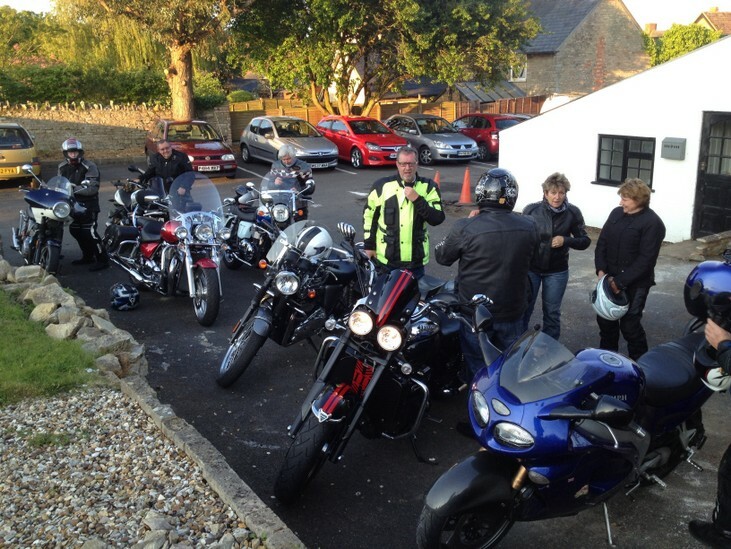 What would have been the branch's first Spring ride out was a complete washout due to the heavy rain that day. And yet, three indomitable Northants TOMCC riders (but do they come any other way? ), i.e. Chris (Bonneville T100), Kevin (Street Triple), and François (Sprint ST955i) turned up at Pure Triumph, ready to conquer wet tarmac in a mile-munching and grueling 30 mn ride. Common sense soon prevailed and the three of them ended up going to a local pub in Wellingborough, not far from the Triumph dealership. However, in an incredible act of bravery and defiance against the elements, they parted vowing to return to face another day on their magnificent mounts, true to the noble spirit of those pioneers who first mastered Northamptonshire's B roads.